​Thanks to those who made the working party. With a good turnout we fitted more fencing, spruced up the patio, got the net up and the wicket had a good roll. Sat 4th May - interclub match. Sun 5th May - home v forest gate. The herts league AGM has happened since my last update. It's confirmed that all games will be overs, though the two's league will be 45v45 rather than 50v50 for the ones. Unsurprisingly the idea to adopt "u11" rules of two for a wide and no extra ball was rejected! Training starts on Monday, 15th April, at 6pm - here's hoping its not too cold! Colts managers will be in contact about fixtures in due course. Let me start with a reminder that training for the whole club, adults and juniors, starts this Sunday (24th February) for 5 weeks at Ashmole Academy from 1 -3. I’m looking forward to dusting off the cobwebs and getting playing again. The Herts League’s (which our adults play in) AGM is Monday. There are a number of rule changes being considered. We’ve collected feedback from the sides and will be voting accordingly. In my last note I touched on the strain our volunteers feel. It saddens me that another volunteer has stepped down – Linda “Ma” Lawless has been our 1st XI scorer for around 30 years and over the years has seen many of our colts progress through the adult sides and into the first team. She’ll be dearly missed, and shares in Tipex are set to tumble! If anyone is interested in taking the reigns as first XI scorer then please be in touch. On a similar note it is also worth mentioning that we are outsourcing teas – well the majority of it. This may mean that a bit more tidying up is required from players, but this was another pinch point for volunteers and we’ve found a local company that have offered good value. Happy new year all. With the (joy and pain of the) 2018 season well behind us, it's time to turn our attention to 2019. Firstly there's our AGM 6:30 this Sunday. I speak to many of you throughout the season and off-season, but this is chance to voice your views and for the committee to set out our priorities, as well as the election of the committee and captains. I'm amazed how we manage to keep the club running through volunteers, but this does cause quite a strain on those that help - if there's any way that you could help out please get in touch. My other key message is to get the indoor training in your diaries. Sunday 1-3 from 24th February to 24th March at Ashmole Academy. This is for the whole club, with the adults and older colts netting, and training and games for the younger colts. It's also an opportunity to introduce new players to the club. We've tried advertising in the past, but the best advertising is word of mouth through those that enjoy playing cricket with us. So please do bring any potential new players along. Apologies for the delay in this update. With all that’s been going on now the season is in full swing its taken me far too long to put pen to paper. With the kids now disappearing for the summer holidays, firstly I’ll reflect on a great colts season. Not just success on the pitch with the under 11s winning the league, but also great to see so many parents getting involved and at the awards BBQ. We’ve got really good numbers at the younger end and if we keep and develop these players in a (fair) few years’ time the adult sides should get a real boost. With that in mind, this Saturday is the club BBQ – a chance for the whole club to come together, it would be great to see some of the colts up watching the adults, before the BBQ begins at around 7:30. Now to the adult sides. The Twos seem to be having fun and Willo’s doing great work – mainly just getting 11 players out! Although the usual availability struggles have seen an early promotion charge falter, on their day they can beat any side in the league, so here’s hoping for a strong end to the season. The Ones have had a more difficult time. Back to back promotions have taken their toll, and with no additions since last year, and missing a couple of players, we’ve struggled. We’ve competed in the majority of games but have failed to put in complete enough performances. The disappointing thing is how, as a side who got used to winning, we’ve reacted to these defeats. We need to pull together, take the expectation and pressure off ourselves, stay positive for longer – even when things don’t go our way – and just enjoy ourselves a bit more. Last week we put out one of the weakest 1 st XIs we’ve had for a while, but the effort was superb – we need more of this for the rest of the season. ​Finally, I need to remind our adult members that membership fees are well overdue. Although we have collected many there are quite a few outstanding, so please get these in promptly at the next game you’re at. With 5 weeks of indoor training complete, we now turn our attention to the ground and, if the weather stops being so wintery, our first match is in a fortnight. In order for us to be ready, we will hold our usual start of season working party on the 7th/8th April. Many hands make light work and as well as the usual jobs, reconstructing the sight screen and net amongst others, I hope for a good turnout so we can address the biggest annoyance of the season… no, not Robbie!… but our hedges. We have some new chicken wire fencing, so it would be great for plenty of bodies to help repair and replace this to minimise balls being lost and disruptions to games. 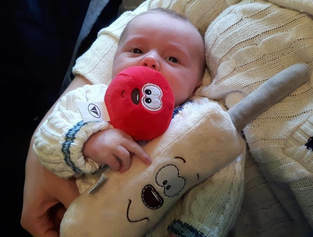 For the few of you that don’t already know, I became a dad at the end of February, when Herbert was born – so I’m doing my bit to increase membership! Though it would be good to have some new members that will be ready to slot into the sides a bit sooner. So, spread the word - mates, mates of mates, colleagues, whoever! – if you think they’ll be interested, tell them about us. It also looks like Herbert’s ready for the new season, are you? If you’ve not already retrieved your kit from the attic now’s the time. Give that bat an oil and maybe even the whites a wash! Talking of whites, it would be great for all our players to wear club whites, with our logo on – this should be worn with pride. This is available from the club shop straight from Tyler’s our supplier. They can take a couple of weeks, so now’s the time to order. As I said at the top of this email, games are fast approaching. So, for adult catches, can you fill out the availability spreadsheet like previous years please – any issues then just let the captains (Liam / Willo) or me (Boris) know you’re available. Colts games start at the end of April, and the colts managers will sort these. Welcome to our 2018 season, and what should be another great year of cricket. That’s right, indoor training is from 25th February until the 25th March, 1 -3 at Ashmole Academy as usual. This is for all playing members, colts and adults. Adults £5 each week, colts included in membership – I hope to see lots of you there. The colts membership is higher as it covers all colts activity including training and matches. For adult matches (which older colts may be able to participate in) there are match fees as usual. This ones for the adults, or the older colts if you fancy a family break. Once a year, for Whitsun, we decamp to Devon for some seaside air and a spot of cricket – 28th May to 1st June. We’re always looking for more tourers, so let us know if you’re interested. Nearly there, one last update, each year we can offer members the chance to purchase a ‘Middlesex Card’ for around £30 (a bit less for colts I believe), these grant the (named) individual access to all Middlesex home games – T20, One Day and County Championship. This year’s details are yet to be confirmed, but we know the scheme will be running again – if you’re interested, let Dave Frame know (if you know who he is! ), or email us and we’ll pass on.